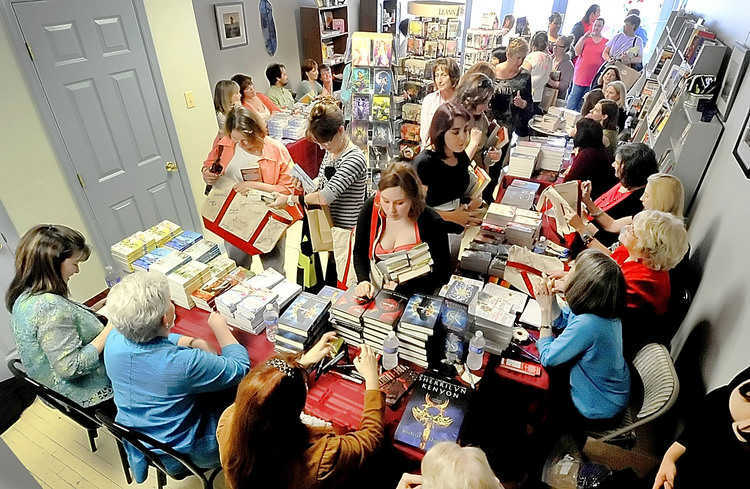 That’s right, folks — bright and early tomorrow morning, romance enthusiasts will be queuing up in Boonsboro, MD for the WRW MEGA BOOK SIGNING at Turn the Page Bookstore. Sixteen authors will be signing, including yours truly! The event runs from 11:30am to 2pm. The store opens at 10am. There will be copies of Enchanted on hand. All books signed at the event must be purchased at Turn the Page. There is no limit to the number purchased, but no “books from home” are allowed at the signing. I know that Turn the Page won’t have ordered my entire backlist, so in the event that you DO happen to bring “books from home,” just please don’t bring them into the store and cause a ruckus. I’ll try to hang out a little bit afterwards and sign what I can for you. I do need to make it back to the WRW retreat by 5pm…but I’ll do what I can! This entry was written by Princess Alethea and posted on April 26, 2012 at 8:19 pm and filed under appearances, Books, Enchanted, Location. Bookmark the permalink. Follow any comments here with the RSS feed for this post. I so look forward to reading ‘Enchanted’, and it was such a delight to meet you at TTP! Heck, I even preordered the ebook… just ’cause.